This article is meant as an introduction to the Gulfstream Aerospace G550 and G450 aircraft. The G550 is in full production and 43 have rolled off the assembly line. The G450 is in flight test and four of these aircraft have been flying many hours to receive final certification this year. The G550 has already set many records for endurance and speed and one recently flew non-stop from Seoul, Korea to Orlando, Florida in about 13 hours. Both of these aircraft have the Planeview avionics system which is a fantastic state-of-the- art pilots dream. 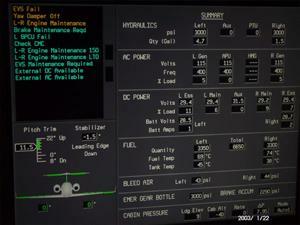 The system displays in the cockpit on four 14 inch monitors mounted side by side across the instrument panel. 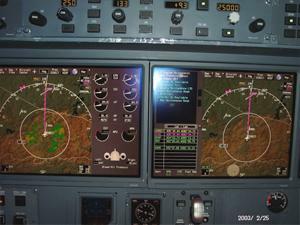 There are two LCD standby instruments also mounted in the center and slightly below the main displays. 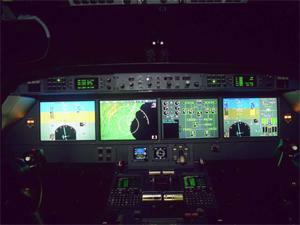 The flight guidance panel for autopilot inputs is mounted above the displays along with the two display controllers. The displays can also be controlled by a custom “ cursor control device “ built into the pilot and copilots armrest. There are three buttons for selecting a display, a cursor button that moves a cross hair around the display, a select button on the back side, a scroll knob for adjusting range and a push to talk switch. The pilot and copilot cannot control each others primary flight display for safety reasons. The displays show all flight data, numerous synoptic pages which show aircraft system data and of course the navigation data. The terrain for the entire world along with tall manmade objects (radio towers) is in the system database. There are dual GPS units and triple Inertial Navigation units so it would be hard to get lost. Flight planning and radio tuning are done on three multifunction control display (MCDU) units that are mounted in the center pedestal. 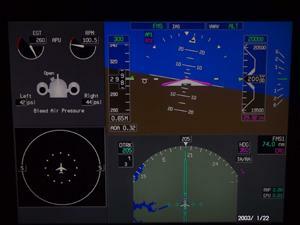 The pilot has a Heads Up Display (HUD) that folds down and is used to display both flight data and Enhanced Vision System data. The Enhanced Vision System uses an infra-red camera mounted under the nose radome. The camera is tuned to the frequency of approach lights but does pick up terrain, other aircraft, animals on the runway etc. This video is projected on the HUD along with the flight data and on approaches in zero visibility ,the runway and dangerous terrain are visible to the pilot long before the co-pilot can see anything looking out the window. Six actual videos of EVS are available on the company website www.gulfstream.com . Select “product enhancements” near the top and follow the pages. 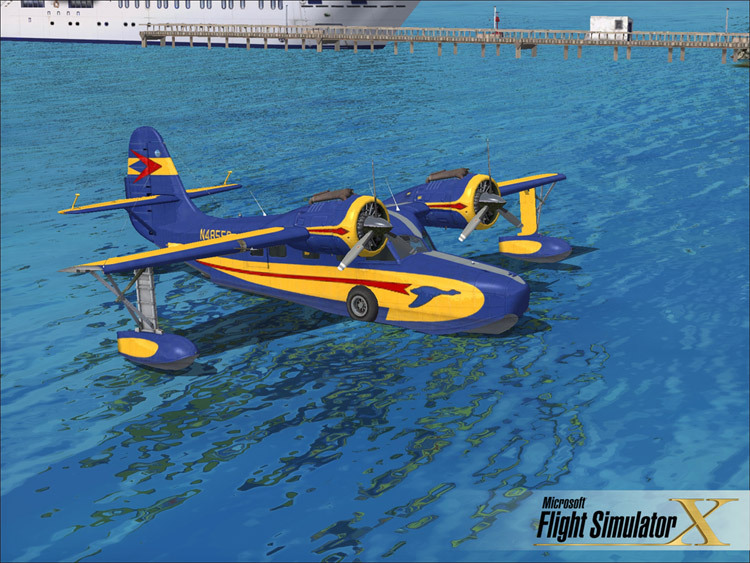 Also available at the website are 3D tours of the aircraft and specifications for someone wanting to design a aircraft for FS2004. I have included some photos from the simulator where I work every day. It is not all fun especially if the system is down. I enjoy flying my FS 2004 at home and would like to see a G450 or 550 on the download page some day. Happy flying!